USA Renovations has provided Mechanically Polishable Self-Leveling Overlays not only in the DFW metroplex but also the 48 states. With integrity + results being the focus of the service we provide, we won’t settle for quality other than the best. We manage several crews which allow us to fit your needs, your schedule and your demand. Whether you are a general contractor or direct buyer, we want to work with you and provide the best Concrete Resurfacing service possible. Self-Leveling Overlay can be referred to as Concrete Resurfacing, Micro-Topping, Cementitious Overlay, and (if a finish is being installed over top) Underlayment. They all require a certified installer to prep and prime the substrate for the concrete resurface to adhere. 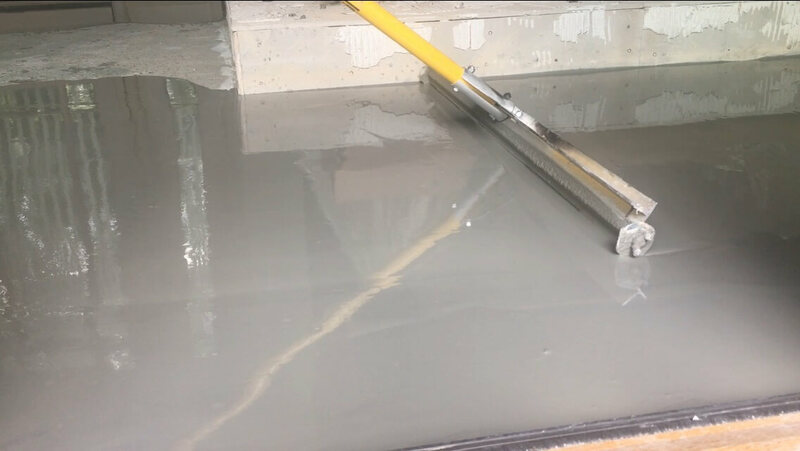 Whether you are wanting a cementitious overlay that will accept mechanically polished concrete or just a higher PSI Micro-Topping there are several solutions that our trained team can offer. Self-Leveling Concrete – One of the major benefits in a concrete overlay is the ability to conceal sections of the substrate that may be unlevel cracked. Using the proper amount of installation depth our team can conceal these areas to restore the desired finish you are trying to achieve. A consistency of Aggregate – when specifications require exposed aggregate it is nearly impossible to predict how concrete will be placed. Large aggregate tends to sink while smaller aggregate will remain at the top. With these variables, it is impossible to mechanically polish concrete and controls the consistency of the exposed aggregate. To ensure evenly distributed exposed aggregate throughout the entire slab’s surface it is recommended to use a high PSI concrete self-leveling overlay. This will create a very appealing finish to customers. Increased Durability – Concrete Overlays / Micro-Toppings finish with much higher PSI than typical substrate concrete. Most Micro-Toppings finish with an up a PSI rating of 7500 – 10000. Increased PSI allows for a much stronger surface that will protect against wear and tear. In addition to the protection benefits should an area of your self-leveling concrete overlay become compromised, repair is relatively easy with very little downtime. Restore Appearance – Over time the surface of exposed concrete, depending on use, will become worn down from normal wear and tear. In some cases, surface repair via shot blast and or concrete planetary grinders are not enough to restore the surface. With the use of a self-leveling concrete overlay, your surface can now be restored back to its original condition. Saves Money – Like the above, in situations that the surface of the substrate is unrepairable, a concrete resurfacer / self-leveling overlay can significantly reduce the cost of a cut-out and replacement of a concrete slab. Self-leveling Concrete overlay / Resurfacing is installed in within three steps. Our certified installers will analyze the surface to ensure a smooth preparation of the surface. With the use of concrete grinders or shot blast our teams with exposing a fresh layer of concrete. Following this, an application of acrylic or epoxy primers will be installed depending on use/system purchased. Upon curing our teams are ready to install the self-leveling overlay / concrete resurface. Much like an epoxy installation, the cementitious overlay is mixed and then installed over the surface. The self-leveling design ensures desirable floor flatness ratings. CONCRETE RESURFACING: Micro-topping what is it AND WHY DOES IT MATTER? Micro-Topping or Concrete Overlayment comes in a few variations most are composed of a cementitious material or resinous (epoxy). Its active ingredient is either water or an active ingredient which allows a strong bond to the substrate. The reason this product is in demand today are the solutions that can be solved given the presence of a worn down concrete surface. Whether the application requires a perfect floor flatness, an evenly distributed exposed concrete aggregate (if polished concrete is desired) or just an overall fresh layer of concrete, this product is an answer to many problematic slabs around the world. What follows is a compressed installation process our team follows to yield the very best final product. Our employees are highly trained to give you piece of mind that you chose the best in the business. The preparation step is an extremely important part of the entire application process. It is at this point we grind employing the use of 1200Lbs or higher concrete grinders. The grinders are equipped with course diamond impregnated segments that shave off a layer of surface concrete to expose a fresh and uniform surface for the primer to adhere too. Upon completion of grinding our team will patch and cracks, pits, or voids at the surface. To expect an industrial strength bond to the substrate, it is important to use the proper primer. Our teams only use the best products on the market and in this case, a resinous primer with a broadcast of grit to the curious primer is the best option. Upon completed step on of the application process, our teams ensure that all areas are prepared for the resinous (epoxy) primer. This two-part epoxy is mixed on site and applied per the manufacturer’s specification. Upon completing the primer our team will then broadcast a sand like grit compound to the curing resinous primer. This step will greatly increase the bond to the final micro-topping / self-leveling overlay. Following this, our professionals will mix the self-leveling overlay and gradually pour section by section. Self-leveling overlay / concrete resurfacer is generally a smooth process. With that said there are several aspects of the job our team of professionals possesses to ensure that smooth process remains as such. After mixing the compound our installers will begin placement of a section. It is important to keep all areas clear at this point to maintain a seamless install. 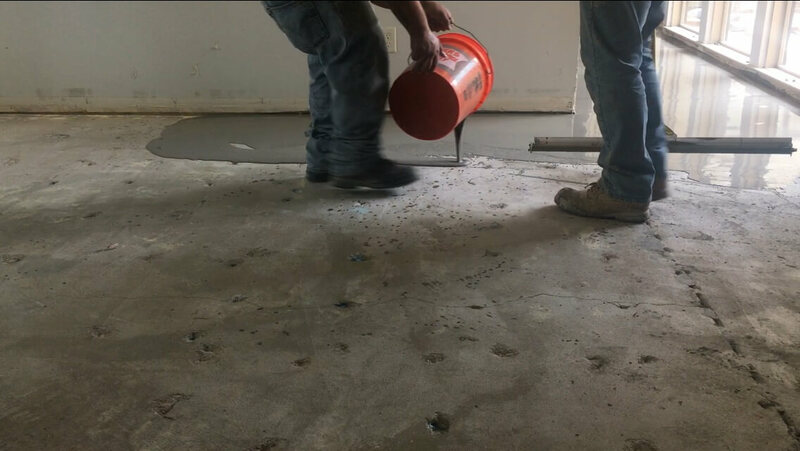 Upon pouring we employ the use of back rollers to spread the material out evenly allowing the self-leveling compound to cure in a near perfect floor flatness rating. This product is quick to cure with foot traffic allowed in about 24 hours. Depending on resinous or cementitious micro-toppings heavy traffic may take 2 – 5 days to fully cure. It is important to understand the manufactures requirements prior to taking possession of the slab. Depending on your specification you may want to keep this floor finish as is or take the surface to the next step by either mechanically polishing the concrete overlay, sealing, or staining. It is important to note not all concrete overlays will allow for staining. Please check with our team to determine what material you will need to accomplish the desired end result. GET YOUR CONCRETE FLOORS RESURFACED TODAY! What are you waiting for? Now that you understand our process a little better and the benefits have been outlined, let’s talk about your space! If you have any additional questions about the Concrete Resurfacing process itself or would like a FREE quote on your floors, contact us today by calling 972-984-4673 or email us at john.clark@usarenovations.com.